Knee arthroscopy, keyhole surgery, is a technique used to inspect the inside of the joint cavity to diagnose and assess damage and, where possible, to treat this damage. Arthroscopic knee surgery involves putting a small telescope and special instruments into the knee, with the ability to photograph and video the operation. Arthroscopic knee surgery is used to treat any number of conditions that occur within the knee from simple cartilage tears to removal of loose bodies and anterior cruciate ligament reconstruction. At the same time all of the other structures within the knee can be clearly viewed and probed. 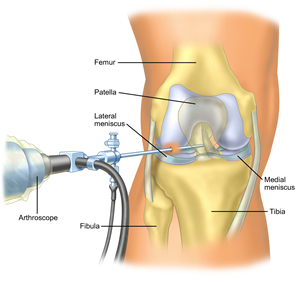 Arthroscopic knee surgery requires a hospital operating theatre and is usually performed as day case surgery. The operation is normally done under a general anaesthetic but may be done under epidural, spinal or occasionally a local anaesthetic if necessary. Typically the patient might come into hospital shortly before the arthroscopic knee operation, having been pre-assessed as fit for surgery, and starved for at least 6 hours. 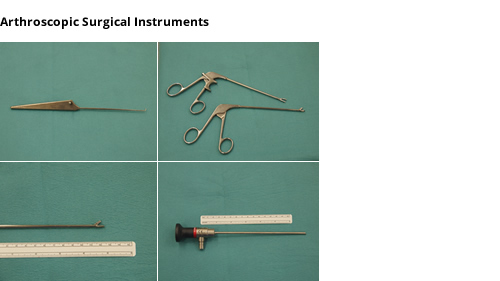 The knee arthroscopy requires two, sometimes three, small incisions in the knee joint to allow insertion of the arthroscope [attached to a camera] and instruments. The knee is filled with clear fluid to allow better visualisation. The length of these incisions is approximately 5-7 mm. Occasionally an incision will have to be enlarged in order to remove a fragment from the knee. The length of time the arthroscopic knee surgery takes depends on the procedure which is being performed. Simple arthroscopic knee surgery usually takes between 10 and 30 minutes. Following the arthroscopic knee surgery, a local anaesthetic solution is normally injected into the joint and around the little incisions, to assist with pain relief. The incisions rarely require stitches, and will usually have a simple dressing applied with a bandage wrapped around the knee. Once the patient has recovered from the anaesthetic and started to mobilise, they are normally safe to be discharged from hospital. Typically this may be 2 or 3 hours after arthroscopic knee surgery, but some patients take longer to recover. Crutches are often not needed after simple procedures, but your surgeon might advise their use after specific procedures, or the physiotherapist may recommend them for a few days depending on how you feel when you are ready to go home. It is essential that the patient has somebody else to drive them home. The patient should undertake essential walking only for the first two to three days. This relative rest will give the knee a chance to settle down, and for the swelling to reduce. It is not a very painful operation, but inevitably there is some aching which improves over the first week or two. For the first couple of days, the leg should be rested and elevated as much as possible. This will help the swelling and pain settle down. Simple painkillers and cold packs may be used as required. Once swelling subsides and it feels comfortable, activities can be increased. The large bandage around the knee is normally removed 24-48 hours after arthroscopic knee surgery. There are usually no stitches to be removed and the wounds should be kept clean and dry until they have completely healed. A small dressing or plaster, which you will be provided with, can be placed on these wounds for a few days following arthroscopic knee surgery. The wounds should be kept clean and dry until at least four days following arthroscopic knee surgery when, providing the wound has sealed, bathing or showering is permitted. The small wounds can remain tender and thickened for a few weeks following arthroscopic knee surgery. Occasionally, a lump remains under one or other of the puncture holes for several weeks – this will slowly resolve, and is nothing to worry about. In the first few days following arthroscopic knee surgery you should be relatively restful, simple rehabilitation exercises including straight leg raising, knee and ankle movements and tensioning of the quadriceps [thigh] muscles should be undertaken as recommended by your Surgeon/Physiotherapist. Physiotherapy: Some patients require physiotherapy following arthroscopic knee surgery. This may take place either before or after the first post-operative check-up depending on individual need. It is not essential, but can improve the speed of recovery. Some procedures, such as meniscal repair or microfracture, entail the need for crutches and a slower recovery. This will be discussed with you. Arthroscopy has a very low complication rate. However, complications such as infection, excessive swelling and pain can occur along with rare general complications such as blood clots and anaesthetic risks. In general, the risk of major problems is much less than 1%. Knee arthroscopy is not in itself damaging to the knee joint. Any ongoing symptoms following arthroscopic knee surgery are usually the result of the problem within the knee joint for which the surgery was recommended and not as a result of the arthroscopy itself.